These Combo-A-Builder kits are composed of two units that break up into three pieces each; your toddler's job is to match the right pieces together. When he gets it right, he'll be rewarded with a fun sounds that goes with his piece! The large toys are perfect for smaller hands, made of PVC and wood. 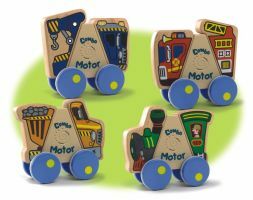 Each unit has designs on the front and back to give you four different vehicles or animals to play with.